Vitamins and minerals are essential molecules for your health, growth and development. Vitamins are organic substances, made by animals and plants, while minerals are inorganic elements, absorbed by plants from the soil and water. Only a few foods contain all three -- vitamin E, vitamin C and zinc. The best way to get enough vitamins and minerals is to eat a complete and balanced diet, with a variety of foods. You should get a sufficient amount of all vitamins and minerals on daily basis to prevent deficiency. The recommended dietary allowances, or RDAs, are vitamin and mineral intakes the Institute of Medicine has determined are sufficient to meet the requirements for healthy individuals. The RDA of vitamin C is 75 mg for adult women and 90 mg for adult men. The RDAs of zinc and vitamin E are 11 mg and 15 mg for men, and 8 mg and 15 mg for women, respectively. Fruits and vegetables are high in vitamin C, as are certain cuts of meat. In plants, the concentration of vitamin C varies according to factors such as soil quality and planting environment. 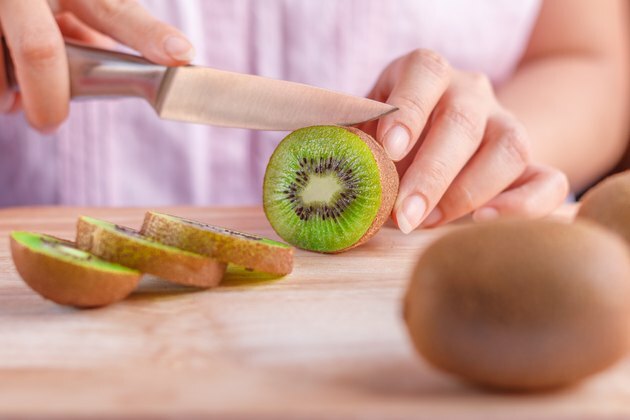 Good sources of vitamin C include red pepper, orange juice, kiwi, grapefruit, broccoli and Brussels sprouts. Smaller quantities are found in tomato and spinach. Vitamin E is mainly found in oils, nuts and seeds. Small amounts are present in spinach, broccoli, kiwi and tomato. Good natural sources of zinc are oysters, beef shanks, crab, chicken leg and lobster. Some food items are fortified with essential vitamins and minerals to ensure better availability. Four cereals that provide 100 percent of the RDA for vitamin E and zinc, and 60 mg of vitamin C include General Mills Total corn flakes and whole grain, Kellogg's All-Bran wheat flakes and Product 19. The levels of vitamins C and E and zinc differ vastly between different cereals; for example, some may contain large amounts of vitamins C and E but no zinc. The best way to ensure you are meeting your recommended daily allowance is to read the label. Other sources for all three molecules are canned tomato products, spinach and sweet potatoes. One cup of canned tomato paste contains 50 mg of vitamin C, 11 mg of vitamin E and 1.65 mg of zinc. One cup of boiled spinach contains 18 mg of vitamin C, 3.7 mg of vitamin E and 1.4 mg of zinc. One baked sweet potato contains 30 mg of vitamin C, 1 mg of vitamin E and 0.5 mg of zinc.